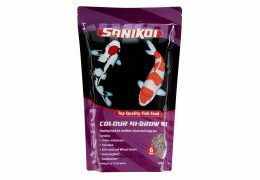 SaniKoi Colour Hi-Grow Mix is a top quality food with a high protein content that may help to promote excellent growth and a natural colour pigmentation. The main ingredients, consisting of fish based products, vegetable proteins, fats and carbohydrates, have been supplemented with krill meal and wheat germs. Special attention has been given to the added trace elements and vitamins, including stabilized vitamin C. In order to benefit a lively bright colour Astaxanthine has been added to the food. 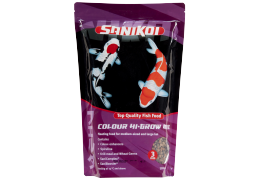 As a consequence of its high protein content, Colour Hi-Grow Mix is fed at water temperatures from 15 °C. 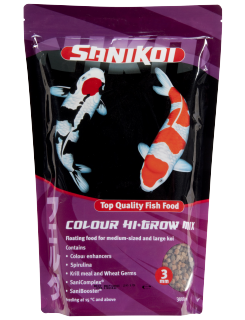 SaniKoi Food is a floating staple food which is used at water temperatures from 15 °C. It is advisable to feed several times a day. Take care that the food will be digested within 5 minutes. Owing to the special composition of the food the water will not get turbid and pond environment as well as the filter will practically not be polluted. 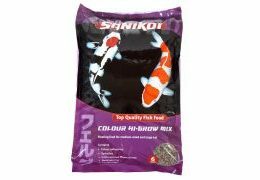 Available in 3, and 6 mm, in upright bags of 3 l and bags of 10 l.
Complete animal feed for fish. 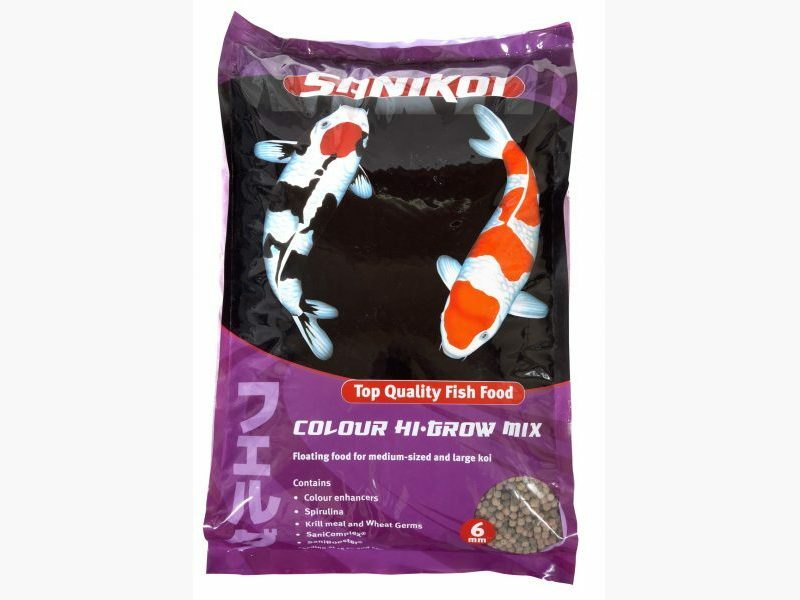 Contains fish meal and/or fish solubles, do not feed to ruminants. Contains gmo, preservatives, antioxidants and colourants. 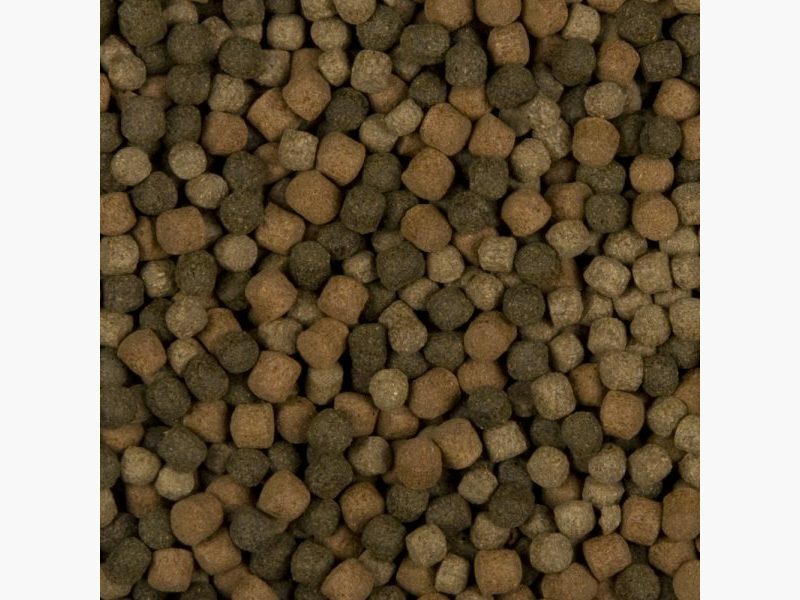 Composition: wheat, fish meal, soya dehulled/extracted/toasted, wheat gluten, wheat germs, fish oil, krill meal, lucerne protein concentrate, spirulina, squid meal and yeast.